Sign up for your 2019 Community Supported Agriculture Food Share! Choose your location - Choose your share. See attached flyer for more information. Come Join Us At Any of Our Weekly Locations, And Learn About Our Vendors! 2019 Vendor Applications Now Available! The South Madison Farmer's Market Hosts a Diverse Array of Vendors from the Greater Madison Region. 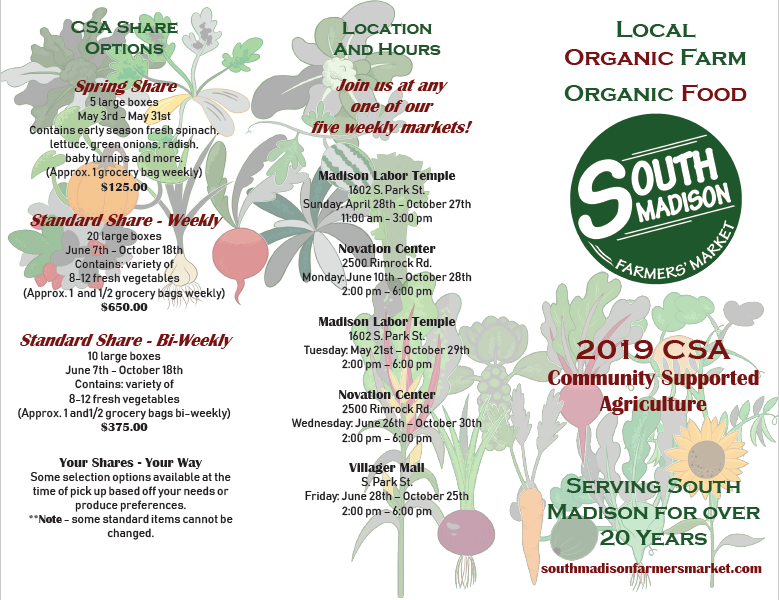 The South Madison Farmers’ Market is located on the South side of Madison, Wisconsin and is one of the community’s greatest assets. Fresh, organic produce, flower bouquets, meat, and baked goods are just a small taste of what you might find at the market. You will also find an accessible and enjoyable community gathering place where everyone is invited to come and stay awhile! The diverse population of the South side of Madison means diversity in the products you will see. There is something sure to please everyone’s culinary preferences. You will find many specialty products at the market that are not available at your local supermarket. We also give a fair market price for farm fresh produce so prices are also sure to please everyone. The market provides consumers with information on organic produce, locally grown fresh produce and their benefits. Monthly events planned around produce in season, such as strawberries, corn, and tomatoes provide the opportunity to sample farm fresh Wisconsin produce, enjoy local musicians, and visit with friends and neighbors. For over 13 years, we’ve been more focused on nutrition, community, diversity, and friendship more than anything else and we plan to keep it that way! Robert was born and raised on Madison’s South side. As the owner of Half the 40 Acres, he has been growing and selling produce for over 20 years. Robert started as a vendor at the South Madison Farmers Market in 2002 and has been the Market Manager since 2003. He is a community leader and advocate in the development of sustainable locally grown food systems.